Shawn, at The Becker's (Shawn and Bill), bestowed upon my humble blog the Good Bloggers Pay It Forward award. If you are not familiar with Shawn, then get yourself over there for a visit! You'll always leave feeling encouraged or uplifted. Shawn always provides positivity and a bright outlook on life! 2. Link to their blog (see paragraph above). 3. 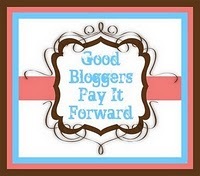 Pay It Forward to 5 bloggers. Numbers 1 and 2 were taken care of in the first paragraph. Number 3 is the one that always gives me such a fit because I just want to give things to everyone. However, when I put them up, y'all won't take them. So, I have decided on a new way for this one- I simply took the first 5 blogs that popped up in my sidebar that have less than 200 followers. So please take a few minutes and go visit these blogs! There's something delightful at each of them be it humor, encouragement, understanding, travel, creativity, family, etc so, if you feel a follow coming on, go ahead and follow them! Blogger is really acting up over here. It´s hard to comment again. I hope this goes through. Ahh, thanks for the love! A good blogger deserves to be recognized...I always have such a good time at your place! Thanks for the shout out...I like your 'pay it forward' method. I think I'll adopt it. Betty-There are some other people still struggling with it too. And Blogger makes it so hard to get in touch with them. Thanks! You're too sweet! Stephanie-Thank you! Sounds like a plan! Congrats on the award! I love your idea for passing it on! As much as I appreciate getting an award from a fellow blogger, I struggle every time with just who to pass it on to. I think most of us do... Now, thanks to you, I'm off to visit some new friends! Congrats to you! It sure went from cold to hot here quick didn't it? The heat is on! Yay! Here in my part of England, Summer has actually arrived today. Woop Woop! Can't believe the difference in temperatures from yesterday, but it's wonderful. Congratulations on the Award my friend. Very well deserved. Congratulations. Great idea. I use to give them to my most recent followers. Mrs. B-Thank you! I have always had trouble narrowing down who to pass them to also. Thought this might help others get more followers! Barb- Thanks! It hasn't been the least bit cool here since February. But y'all get a bit cooler weather than we do in the winter and spring. However, summer is HERE. You are right- the HEAT IS ON! Desiree- You are too kind and I am blushing! Thank you so much! This- The good news about the heat is that our air conditioning is working! Thank you! Debby-Thank you! Oh yeah, recent followers is a good way too! I love the way you passed this on...Great Idea! And I'm jealous of your heat...I wore a turtleneck today it's still so cold here! And great way to pass on the award and the love Pam. I'll be checking out those blogs! Shawn-Thank you! Hope you have a great weekend too! Sandra-Thanks! WTH?! Still cold? We're in the 90s. All Week. No rain insight. Enjoy your cold!